There are bakery aromas that help me time travel in my mind. Until I was 3 ½ years old I lived with my parents and brother in an apartment above my grandparents’ bakery, Amsterdam’s Bakery, on Palisade Avenue in West New York, New Jersey. I do not remember much of those days. But I remember the smells. Even though we moved to North Bergen, my brother and I alternated weekends at my grandparents. They were wonderful adventures. My younger sister’s birth was the reason we moved, as well as the reason we were sent off to my grandparents. It gave my mom a needed break. Staying with my grandparents was the best. They lived in the top floor of a three-story building. The bottom, ground level was the bakery. Above it was two smaller apartments. And the top floor was my grandparent’s home. I loved going to sleep at night, knowing in the morning I was expected to get up on my own…get dressed and make my way to the bakery, with those glorious aromas. I loved walking into the store area. Grandma would be behind the counter. The moment she saw me, her eyes would light up. Breakfast would soon be coming. When done, I would enter the bakery! Grandpa and Uncle Leo would be busy. But never too busy to forget to give me my dough, raisins and some chocolate chips to make cookies. I would knead my dough and make round cookies. These would be baked and given to me to take home for my parents. After I finished my baking, I always returned to the storefront. Now was snack time. All that work in the bakery made me hungry. It was time to forage along the case and decide which of my favorite treats I should eat. A crumb bun, a chocolate chip cookie, a linden tart, a black and white cookie? Oh there were so many choices. But these were my favorites. Usually after breakfast, I would have a crumb bun. There is a special way to eat it. You put it on a napkin upside down. Eat the cake first and save the crumbs for the last. Delicious! Great with a cup of tea! My chores were not over of course. After that snack, I always worked behind the counter. There was a wooden milk carton to stand on to help the customers. Grandma and I would work together. But I got to put the money in the old cash register and give the change. 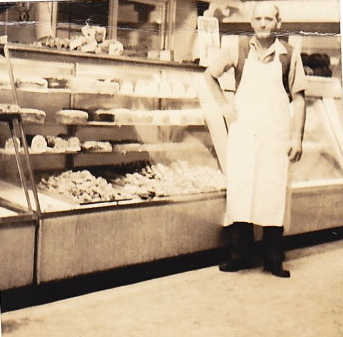 Our lives changed in 1969 when my grandfather sold the bakery. No more early morning deliveries of bread and cake to our front door. No more weekend baking expeditions. My mother went for months looking for a bakery that met her expectations. She finally settled on Hill Top, although it was not the same as my Grandpa’s baking, it was a wonderful second best. But my grandfather did not totally stop baking. He moved some of his equipment: giant mixer, baking trays, cooling racks, bowls, whisks and more, to his home in Kauneonga Lake, New York. This began another adventure in baking. Grandpa had all this equipment moved to his basement where he set up a little bakery. He would make cookies, challah, cakes and pies. And we would help! I learned many ways to braid a challah, among other skills. I remember one time he made so many plum cakes. Someone gave him a bushel of plums. We baked for an entire day. He made it into trays upon trays of cakes that he gave to Beth El Synagogue in Kauneonga Lake, for a Shabbat oneg. Every year for Rosh Hashannah and Yom Kippur , he made dozens of round challah. We did not eat them all, so he must have given them to his friends. Even though he was retired, he still would bake for Katz Bakery on the weekends. When my brother was old enough, he started baking as well and working for Katz, with my grandfather as his teacher. My grandfather’s attitude was that learning a skill was important. My brother became a chemist….perhaps all those recipes helped him learn formulas later on. My grandmother and I worked at a Katz outlet in Kauneonga Lake. We were only opened on the weekends. But it was my first real summer job. I was only 14. There was no baking there, just a storefront to sell the cakes, cookies and breads. I worked there for two summers. It was very close to the post office; and friends would come and visit me when they got their mail. I loved working there because it brought back memories of my grandparents’ bakery, but it was not quite the same. My Grandpa’s chocolate chip cookies were still the best. His basement bakery was the source of many care packages sent to my brother and me in college. Whenever the box of chocolate chip cookies arrived, my roommates and friends would line up for a sample. To this day, when I enter a bakery, the aromas take me back in time. I see my grandparents, I smell the bakery, I remember working with them and sharing precious time. I am once again a child waiting for a favorite treat.